Plants and water go together, but today no one wants to waste water. New solutions are needed to target areas and “water smart.” Not only will doing the right thing save time and money, but also provide better results. Until now, the technology for sprinkler sets has been too complicated and intimidating for many potential users. They were not even considered a lawn and garden item. 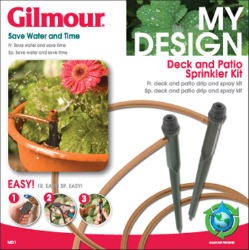 Gilmour's My Design has three easy steps: (1) attach hose and valve to faucet (2) roll out hose to area to be watered (3) attach sprinkler. Continue steps 2 & 3 as needed. Parts are reusable and can be repositioned as plants are moved. The Deck and Patio Kit contains the following: 1 30ft x ¼” hose, 6 adjustable sprinklers, 5 T – connectors, 1 Faucet back flow connector, 3 flow restrictors. Ideal for containers. Coverage range of one gallon to 10 gallons per minute.